What a promise! Actually, promises. First, here’s a book that teaches kids all about the fascinating world of bees. Second, fun exercises, activities, and illustrations engage the imagination and offer a deeper understanding of bee life and bee behavior. Third, by following a few simple steps including removing the book’s cover and taping it together, readers can transform the book into an actual living home for backyard bees. Fourth, added all together, Turn This Book Into a Beehive! lets kids make a difference in the world—building a home where bees can thrive is one small but critical step in reversing the alarming trend of dwindling bee populations. 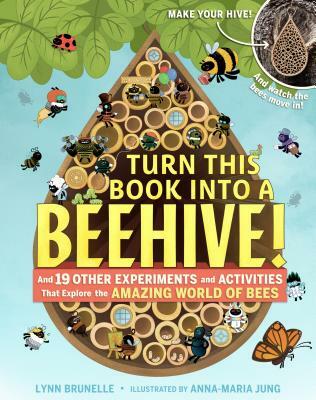 Written by Lynn Brunelle, author of Pop Bottle Science, whose gift for making science fun earned her four Emmy Awards as a writer for Bill Nye the Science Guy, Turn This Book Into a Beehive! introduces kids to the amazing mason bee, a non-aggressive, non-stinging super-pollinator that does the work of over 100 honeybees. Mason bees usually live in hollow reeds or holes in wood, but here’s how to make a home just for them: Tear out the perforated paper—each illustrated as a different room in a house—roll the sheets into tubes, enclose the tubes using the book’s cover, and hang the structure outside. The bees will arrive, pack mud into the tubes, and begin pollinating all the plants in your backyard. Twenty experiments and activities reveal even more about bees—how to smell like a bee, understand the role of flowers and pollen, learn how bees communicate with each other through “dance,” and more. It’s the real buzz on bees, delivered in the most ingenious and interactive way. Lynn Brunelle, a four-time Emmy Award–winning writer for Bill Nye the Science Guy, is the author of Pop Bottle Science and Camp Out! She lives on Bainbridge Island, Washington, with her husband and two children. Juvenile Nonfiction / Animals / Insects, Spiders, etc.